Eaton Crouse-Hinds Freedom Series 3-Phase Non-reversing contactor has coil voltage rating of 480-Volt AC at 60-Hz or 440-Volt AC at 50-Hz. Contactor has current rating of 135-Amps and voltage rating of 600-Volts. 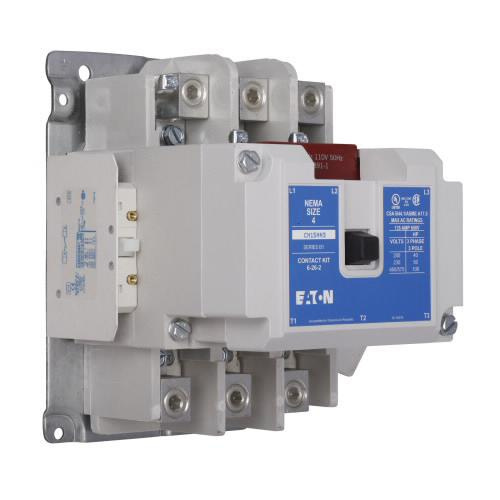 This size 4 NEMA rated contactor has long life twin break and silver cadmium-oxide contacts. This 3-Pole contactor has power rating of 25 hp at 208-Volts, 30 hp at 240-Volts, 50 hp at 480-Volts, 50 hp at 600-Volts for 3-Phase. It measures 7.25-Inch x 7.05-Inch x 9.11-Inch. Contactor is UL/cUL listed and CSA/CE certified.